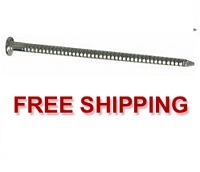 This paintable plastic hidden tilt rod is sold in 7 ft lengths. Available in 2 inch, 3 inch, and 4 inch spacing between louvers. 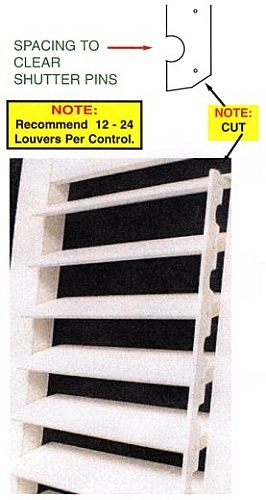 When using a hidden tilt rod system, you will need to fabricate your shutter using hidden tilt rod louver pins on the side that you will be installing your hidden tilt rod. These louver pins provide a wider gap between the end of the louver, and the inside of the stile required by the hidden tilt bar. 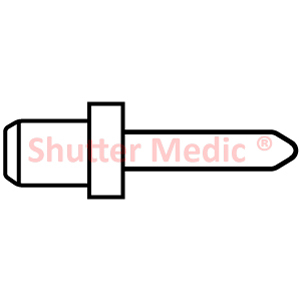 Standard nylon louver pins can be utilized on the opposite side of louver that does not have the hidden tilt bar attached to it. See Installation Diagram. Attachment of Hidden Tilt Rod to louvers is accomplished using a small screw or Hidden Tilt Rod Nail. I bought 20 of these hidden Tilt Rods for some 6' tall custom shutters that I was building. These hidden tilt rods work much better than the ones sold from Rockler. You need to mortise out a small area in the stile for these with a router, which does not take that much time. The rods paint up nice and work great. I would recommend these to anyone. Excellent product and exceptional service. The 2" hidden tilt rods worked extremely well.